Remaining 2016 Republican National Convention traffic restriction will begin on Monday, July 18, 2016. Below is a list of the restrictions in place. The following traffic restrictions will be implemented beginning at 10:00 a.m. Monday, July 18 and will remain until 2:00 a.m. Friday, July 22. Restricted from traveling westbound on the Innerbelt Freeway between East 21st Street and the Interstate 490 interchange. Restricted from traveling eastbound on the Innerbelt Freeway between the Interstate 490 interchange and Prospect Avenue. Westbound lanes of the Innerbelt Freeway will be restricted to one lane from East 21st Street to just west of the West 3rd Street overpass. Eastbound lanes of the Innerbelt Freeway will be restricted to one lane from just west of the West 3rd Street overpass to the East 14th Street interchange. In the triangular green space at Ontario Street and Huron on the western side of the Republican National Convention Complex. This space is accessible from the west side of the Lorain-Carnegie (Hope Memorial) Bridge via the north side pedestrian path. On Erie Court between East 9th Street and East 14th Street. On Prospect Avenue between Ontario Street and East 9th Street (the segment that is closed to vehicle traffic). On Huron Road from East 7th Street to Prospect Avenue. 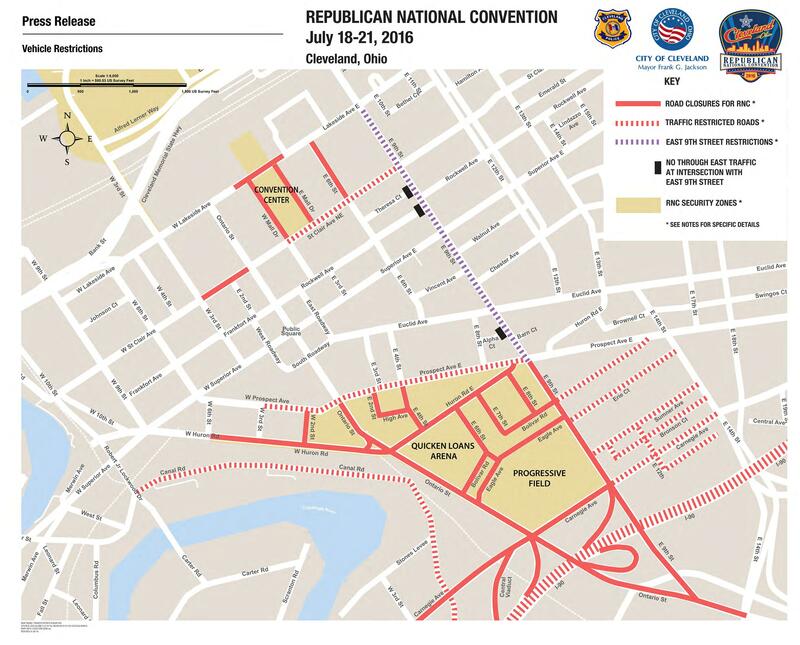 View the full list of traffic restrictions for the 2016 Republican National Convention here.